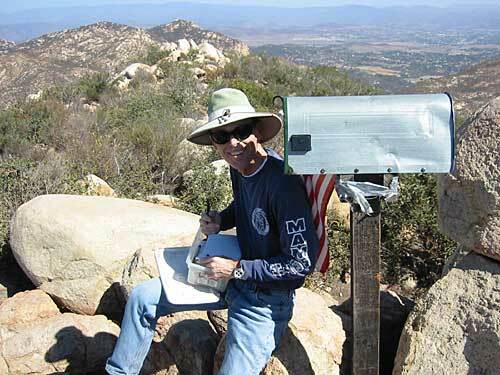 Pat Witt and I hiked up Iron Mountain in Poway, California on October 4, 2002. 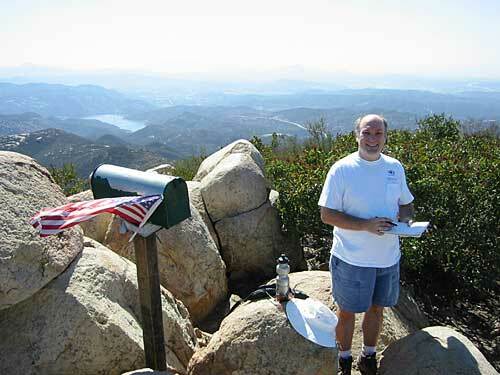 Here's Pat signing the register at the summit. Here I am with the register. Photo by Pat. And here's a stitched 360-degree panorama of the view from the top of Iron Mountain. At the left you see Poway. Marine Corps Air Station Miramar is at the far right (but hard to recognize). The water right of center is San Vicente Reservoir.